Time to do a little casting catch-up. There's still no news on who'll play the all important role of the whisk in Beauty & the Beast—that's the part my son played back when he was a freshman in his high school's production—but I do have some more trivial casting bits to share. Last we talked B&B, Luke Evans was going to flex his muscles as Gaston, Emma Watson (her again!) was Beauty, Dan Stevens was all set as the Beast and Emma Thompson was rumored to play Mrs. Potts. So, let's catch up. Good news for all my fellow Thompson fans; she's in. As is Ian McCellan as Cogsworth and Josh Gad is Le Fou. Stanley Tucci plays the Cadenza. Honestly I don't remember Cadenza from my kid's play. And I don't know what a cadenza is. I know what a credenza is but not a cadenza. Okay, I do now because I looked it up. A cadenza is 'a virtuoso solo passage inserted into a movement in a concerto or other work, typically near the end.' Hmmm, speaking of virtuoso's, Audra McDonald, the acclaimed singer/actor we saw last as Mother Abess in that NBC live production of Sound of Music. plays the Garderobe, not to be confused with a chifferobe. And in diversity news, at least it won't be a completely white cast. I'm pretty sure he can handle Be Our Guest in Beauty and the Beast! Hey everyone, a quick question if you have a mo. Do you have any suggestions to help me improve the overall appeal of the site? Is there a template design you'd recommend? And would you enjoy my blog more if it were dark ink on a light background? I use the dark background to emphasize the visuals but are the white letters too difficult to read? I love Ewan McGregor too. 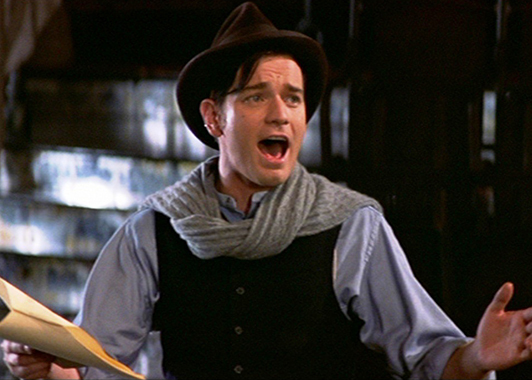 And yeah, he was especially lovely in Moulin Rouge. Thanks for the stop by. I'll check out your Cinderella blogpost too!